How drug makers manipulate patents to market high price prescription drugs that nobody wants. And strategies so you can get what you need. In the summer of 2014, Dr. Laura Schiller, an obstetrician-gynecologist in New York City, suddenly began getting frantic calls. Patients had gone to the pharmacy to pick up their usual prescriptions for the birth control pill Loestrin 24 Fe, only to be told it was no longer available. Oral contraceptives are not much different today in their essential ingredients than they were thirty years ago. But they have been repackaged and marketed and, often, repatented in new (but not necessarily improved) forms. The dozens of options offer slightly different hormonal mixes and dosing schedules. Women choose a particular pill because for them it produces fewer side effects like bloating, or comes in a more convenient dispensing pack, or just because it has nicer advertising. Warner Chilcott’s Loestrin 24 Fe was one of the most popular contraceptive pills. It combined a low dose of estrogen in a twenty-four-day cycle and iron; periods were light but predictable. It sold for about $90 retail in the United States and $20 elsewhere in the world. Nonetheless, with U.S. purchases covered largely by insurance, sales of Loestrin 24 Fe climbed 25.4 percent to $89 million in 2012. To protect its franchise, Warner Chilcott had sued a few drugmakers who planned to make a generic for patent violation in 2011, thereby gaining thirty extra months of protection. The suit never went to court, because Warner Chilcott used a tactic called “pay for delay” to settle: the company gave two drugmakers, Watson and Lupin, various financial incentives in exchange for agreeing to delay their applications to make a generic. The arrangement suited all the manufacturers just fine, but it was clearly bad for patients. According to industry analysts, every six months of delay before generics hit the market can be worth billions in profits or added spending. By 2014 that strategy had played out, and the first patent for Loestrin 24 Fe was finally slated to expire soon. But before it did, Warner Chilcott had another trick up its sleeve. It conducted research and development to invent a new chewable form of the pill with a new name, Minastrin 24 Fe, and a new patent. Then Warner Chilcott stopped making the old favorite, Loestrin 24 Fe. There were no generic versions of the pill on the market yet, so patients who wanted to stay with the same formulation of birth control pill had no choice but to switch to the chewable brand. The advertising for Minastrin touted its benefits; for example, the pill could now be taken even if there was no water available. Most adult women, however, had no desire to chew a birth control pill. Some objected to the artificial sweeteners. The new version cost between $130 and $150 when paying cash with a discount card, depending on the pharmacy— about 30 percent more than the old. The industry name for this maneuver is “product hopping,” and Warner Chilcott was, historically, a master artist. A lawsuit filed by Mylan Pharmaceuticals alleged that Warner intentionally moved its acne medication Doryx from one form to another three times in order to stymie the launch of a generic. It swapped a capsule for a tablet; developed a version that could be broken up and sprinkled on applesauce; and introduced a new scored pill. Since generics must be identical in dosage and form to the brand-name drug for a pharmacist to substitute, each move succeeded in delaying competition from generics for years. We live in an age of medical wonders—transplants, gene therapy, lifesaving drugs, and preventive strategies—but the healthcare system remains fantastically expensive, inefficient, bewildering, and inequitable. Who among us hasn’t filled a prescription or opened a medical bill and stared in disbelief at terrifying numbers? And yet we’ve come to accept it as an inevitable burden of being American. Now that you’ve read about how some unsavory business practices have hijacked our healthcare, you know we have the choice to stop it. This book is a call to arms, as well as a road map for us to fight back personally, politically, and systematically. So what can you do about the high cost of prescriptions? Americans comparison shop for cars, bread, electronics, and just about everything else—except prescription drugs. More than half of us regularly take prescription medications, and the contents of these pills, potions, and creams are highly regulated. We should be able to—simply and easily—buy from the cheapest vendor and at the lowest personal cost, but we can’t. From month to month, the price of medicines can change, along with our co-pays, and we don’t find out until we’re picking up our filled prescriptions at the pharmacy counter. The government will, perhaps, one hopes eventually take action to address burdensome drug expenses, since virtually every politician has recognized this as a major problem. But many of us simply can’t afford to wait for our frustration to overcome DC gridlock, so in the meantime it’s best to adopt some personal strategies to dampen the impact. Don’t equate expense or sudden price hikes with an increase in value; research alternatives. Ask your pharmacist or doctor if there are more cost-effective ways to take your prescribed medications. Many oral contraceptives are more or less interchangeable. My favorite antibiotic for smearing on infected cuts is a prescription preparation called mupirocin (brand name Bactroban), which is available in ointment or cream form. The clear ointment, which is older and off patent, costs $10 a tube. The white cream, which the drug company created when the ointment’s patent was about to expire, is no better or worse in my experience and costs $115. A doctor writing the prescription likely doesn’t know there’s a huge price difference. Some acne preparations that cost $100 to $300 a month, such as Epiduo, are no more than a far cheaper generic topical antibiotic or a vitamin A derivative combined with peroxide. Check your insurer’s formulary to find out if different strengths of the medication are covered. One patient saw her co-payments for her usual dose of a thyroid drug quadruple overnight to nearly $300 a month, be- cause that strength was removed from her insurer’s preferred formulary. But she discovered that she could negate the increase if she bought a higher dose (still on formulary) and cut the pills in half. Shop Around GoodRx.com, a Web site and mobile app, will give you the cash price of every medicine at pharmacies in your area and provides coupons for dis- counts (the price you will pay if you forgo using insurance). A prescription’s price at the pharmacy depends largely on the wholesale prices agreed to by your pharmacy, the drugmaker, the pharmacy benefit manager, and your insurer, plus the markup at the store. In some cases, the full cash price will be less than your insurance co-payment, in part because many chain stores offer rock-bottom cash prices on common pharmaceuticals to get shoppers in the door. If that’s the case, tell the pharmacist you want to pay cash instead. 2. Rely on overseas mail-order pharmacies to order long-term medicines whose efficacy can be clearly measured, such as those that control cholesterol or an expensive medicine for low-grade type 2 diabetes; neither requires precise results and you can check these parameters to ensure that the medicine you received is working well. Starting a regimen with a foreign substitute might be less well advised for a drug used to prevent organ transplant rejection or seizures (since blood levels of these medicines are notoriously finicky). Companies like PharmacyChecker.com will help you to ensure that the medicines you are ordering are not fakes. These online clearinghouses vet the pharmacies that sell drugs on their Web sites and source from English-speaking countries, so packaging instructions and warnings labels are understandable. From An American Sickness by Elisabeth Rosenthal. Reprinted by arrangement with Penguin Books, a member of Penguin Group (USA) LLC, A Penguin Random House Company. Copyright © Elisabeth Rosenthal, 2017. 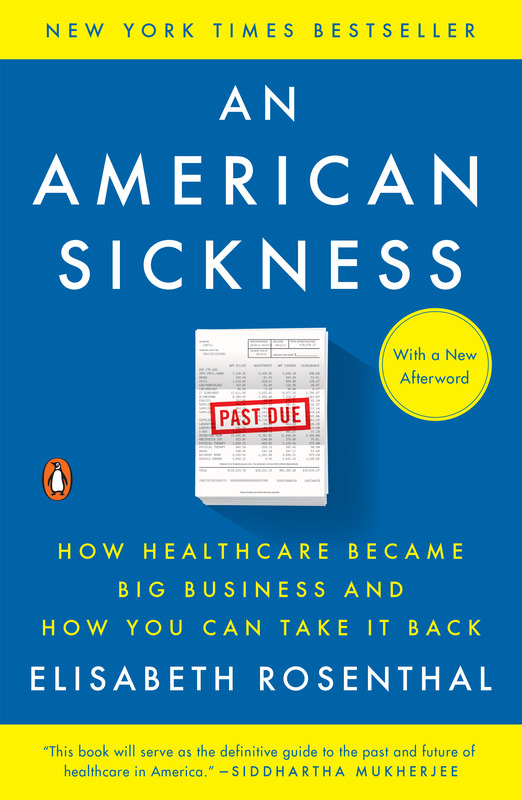 ELISABETH L. ROSENTHAL is a New York Times senior writer who trained as a medical doctor, and the author of "Paying Till it Hurts," the award-winning series on health care costs and pricing. During 20 years as a reporter and correspondent for The New York Times, she has covered a wide variety of subjects. Born in New York City, Rosenthal received a B.S. degree in biology from Stanford University, an M.A. degree in English literature from Cambridge University, and an M.D. degree from Harvard Medical School.